It’s never been quite clear as to Sam’s actual ethnic origin or background, but we do know that even though he did have some very close family ties to a large number of aunts ‘n uncles and a slew of cousins in several of the smaller towns and villages located “south-of-the-border”, he also had an Aunt Eunice and an Uncle Sandy who lived in the Dakotas. It was also rumored that he had a half-brother who lived with his trusted, middle-aged surfboard buddies somewhere on the beaches of Maui. Sam once visited the Alamo, but was fairly confused as to which side he would have actually rooted for. His most memorable all-time heroes were Hopalong Cassidy and Emilio Zapata. Sam always referred to these personal dilemmas ‘n contradictions as the “Yin ‘n Yang thing” associated with his past. 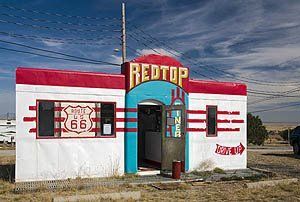 He had the reputation of a legendary grill cook along the old section of the Route 66 Highway, from Amarillo to Albuquerque. He worked at The Red Top Diner in New Mexico, Roy’s Café in Amboy, California, and, the One Stop Grill and Irene’s Place in the Flagstaff-Winslow area. When some well-known celebrity chef tracked him down at the Red Top and annoyingly kept urging him to be filmed on his national TV show to reveal Sam’s secret Chile recipe, he decided to hit the road again for what he often called “get-away time”. He mostly traveled with his beloved cousin Jimenez who also knew a thing or two about hustlin’ up some tantalizing grub, most of which came from recipes that they both learned from their Auntie Rosita, who owned a small but well known cantina down in Juarez. They did most of their traveling in Sam’s old Ford Fairlane. It was a sun-bleached Red, but highly polished and heavily chromed, “tripped-out ragtop”. Cousin Jimenez’s ’57 Chevy pickup truck, the love of his life, had broken down while they were staying at The Blue Swallow Motel in Tucumcari, New Mexico, off the old 66. Terri and Bill, the owners and close friends, graciously let Jimenez leave it out back until he could return and get the axle fixed. The two cousins were known to be inseparable. They never liked to stay in one place too long. Together, they’d lived both the good times and bad. They knew what it was like to be broke and not able to find work. They once survived for three long days by sharin’ a melted-together roll of Necco Wafers and a can of warm Tecate that they’d found buried in the back of glove box in the dust covered Chevy after the pick-up’s radiator gave out in the heat of the Texas Panhandle. 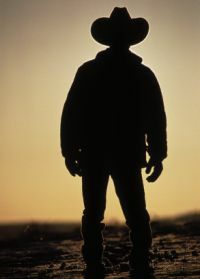 When times were hard, they knew how to wash dishes and pick up odd jobs to make ends meet, and, to remove the spines from a freshly sliced piece of cactus before they took a bite out of it. We happen to meet Sam while we were traveling through the Baja coastal town of Rosarito. We stopped into a rather run-down watering hole ‘n billiard parlor named the Mexicana Bar, a place that looked like it had a certain “local charm”, located off one of the back streets away from the downtown area. Sam had just run off ten straight sets of 8 Ball and invited us to share the cold bottles of Dos Equis that he’d won from the in-house hustlers. He told us that his cousin Jimenez had decided to hitch-hike back to New Mexico to get the truck fixed, so Sam invited us to hop in the old Fairlane and visit some of his long time compadres at Hussong’s Cantina, a landmark bar & grill located further down on the Baja in the town of Ensenada. Let’s just say that Sam was a “well known” figure in these parts. We were often delighted to hear, “Sorry, your money’s no good here if you’re a travlin’ friend of Sam’s”. We ate a bunch of fish tacos down by the pier served by a family that he said was related to his mother’s cousin’s brother-in-law, and then he took us to Melvin’s Rock-n-Roll Bar and another place called Sam’s Bar at the Plaza Blanca in the Baja Resort. The bartender told us that Sam was one of the original partners when it opened and that the bar was named after him, but he said that Sam later decided to sell his share of the business when it became too crowded and popular with the tourists. Sam never would confirm what the bartender claimed. We bid farewell early the next morning before we returned to the Cape. We told him of what we had decided to do; to open a restaurant named after him, Sam Diego’s. He gave his blessing and promised that he would send us all of his family recipes. He was true to his word. We hear from him time-to-time. We get notes & recipes written on old motel stationary, sometimes on smudged bar napkins and cheap post cards from wherever he and Jimenez may be traveling. He always writes that he’ll be coming to visit us soon, but we haven’t seen him yet. So, if you happen to be sitting in a diner in an old prairie town or in a local cantina somewhere below the border, and you hear some guy talkin’ about his friends operating a spot on the Cape with his name affixed to it, tell Sam that we said “Hello”.